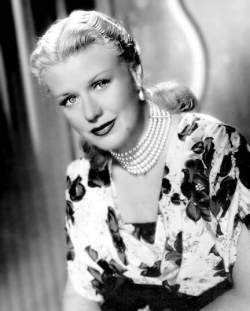 It's easy just to write off Ginger Rogers as Fred Astaire's most famous dance partner; that is, until you've seen some of her other films. Ginger is one of those actresses who has pleasantly surprised me as I've gotten to know her work better. She was a first-rate comedienne and even the highest-paid actress in Hollywood for a time. While her dramatic films aren't as well known as her comedies and musicals, the more serious acting abilities they display are still noteworthy and even won her a Best Actress Oscar in 1940. Yes, she could sing and dance, but that was just the beginning. Although she made a score of films on her own before Fred Astaire ever came to Hollywood, it was during the course of their ten musicals together (starting with FLYING DOWN TO RIO (1933)) that Ginger's movie career really took off. At left is a publicity still from their first starring musical together, THE GAY DIVORCEE (1934). 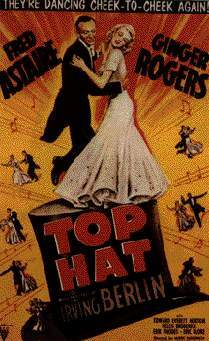 TOP HAT (1935) was Ginger and Fred's fourth picture together and a huge box-office success. It broke records at Radio City Music Hall, was the second biggest money-maker of the year behind MUTINY ON THE BOUNTY, and even earned an Academy Award nomination in the Best Picture category. 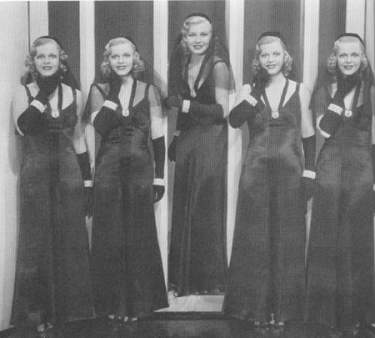 Ginger surrounded by her clones in SHALL WE DANCE (1937), the seventh of the Ginger and Fred series. While some of the dance numbers in this film aren't up to the standard the duo had set with some of their previous films, it does mark the beginning of a new trend in the series -- that of stronger plots. 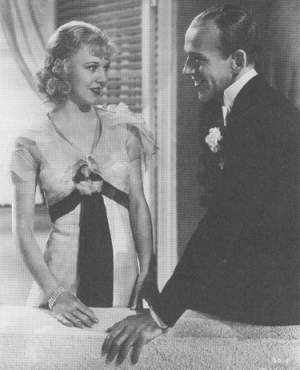 THE STORY OF VERNON AND IRENE CASTLE (1939) was the last film Ginger and Fred would make together for RKO, their home studio during the 1930s. Unlike their other musicals, this one is a biopic in which the two play out the lives of a real couple, the famous ballroom dance team of the nineteen-teens, Vernon and Irene Castle. At right is a still of Ginger (as Irene) imitating Bessie McCoy singing "The Yama Yama Man." It would be ten years before Ginger and Fred would again be paired in their tenth and final musical, MGM's THE BARKLEY'S OF BROADWAY (1949). For an in depth look at their films together, see the Classic Screen Teams: Ginger Rogers and Fred Astaire section. "We'll show 'em a thing or three." 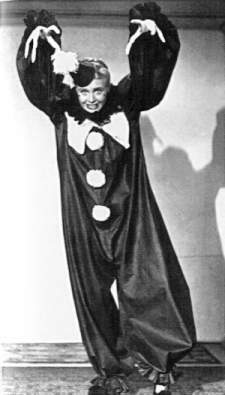 --as Honey Hale in FLYING DOWN TO RIO (1933). "Is annoying people your life's work?" --as Peggy in TWENTY MILLION SWEETHEARTS (1934). "I just had the most embarrassing experience-- a man tore my dress off." --as Mimi Glossop in THE GAY DIVORCEE (1934). "You know, it isn't that gentlemen really prefer blondes. It's just that we look dumber." --as Sherry Martin in FOLLOW THE FLEET (1936). "It takes a lot of brains to be dumb." --as Sherry Martin in FOLLOW THE FLEET (1936). "If you're trying to annoy me, you certainly are succeeding." --as Penny Carrol in SWING TIME (1936). "I've got enough nerve to do anything." --as Penny Carrol in SWING TIME (1936). "I didn't know getting married was so depressing. I'm sorry now I asked you." -- as Linda Keene in SHALL WE DANCE (1937). "I refuse to be a bowl in a gold of fish." -- as Linda Keene in SHALL WE DANCE (1937). "Me? That's not me! Do you think I'd be caught dead in that cheap negligee?" -- as Linda Keene in SHALL WE DANCE (1937). "If we get married now, I can start divorce proceedings in the morning." -- as Linda Keene in SHALL WE DANCE (1937).